This might be stating the obvious but the power spike is just unreal at the moment and pretty much all classes have oneshot cheese builds, even some of the builds that are not suited towards oneshotting oneshot you does with the sheer strength of power builds. Worst thing about it is that most of the times there is no counter play to it. It kills the fun because it doesn't reward me by getting better and more skilled at the game. I don't think I've seen someone running condi in a long while in WvW with the exception of some celestial scourges or roaming mesmers due to the power being so meta and the big condi cleanse wars. Some people may argue that "Hurr durr just use your defensive cooldowns". Well that's impossible when a deadeye comes with stealth and oneshots a heavy armor user from 100% to 0 from stealth. Or a holo comes from stealth with an overheat rocket and hits heavy armor for 28k. This can also be done, again, from stealth, with power GS mesmers. The other classes I can somewhat agree to having some but yet VERY little counter play to it. Its basically the person that flunks the first dodge or defensive that is dead or if you're caught blinking for a second while running. My suggestion for this, but it might be too late or way too much work to do, is to try to balance the game towards longer and more sustained fights that actually rewards you from being good at the game. Gladly discuss why I'm wrong/right, what to do about this if you think this is a problem. 1) Oneshots happen to glass, heavy armour is not an argument here. What matters most is the defensive traits and then stats (but in considerably larger amount that what only armour gives). Even on my thief builds it takes 2 and more guys to jump on me at once to kill me so fast I can not do anything. On other classes with automatic invulns/imuns it does not work at all except for very specific situations. 2) I think what is getting out of hand a bit is synergies with certain group compositions but not an individual damage numbers. But even though it is miles better then have slow meta IMO. I've never been one shotted..I've been killed fast for messing up..or taking on a thief in poor terrain but not one shotted. Any armor can tank or go glass. Just one of the meta D/S SpB builds. Around 24k hp. Just got oneshotted by an invis holo while running again btw, think it was the same holo as before. 15k overheat and 12k mini rocket. EDIT: I run lesser endure pain trait, didnt do anything, no ICD or CD on it either. Problem is when 1: most classes can't play bunker properly, and if they somehow make a "bunker" build on their class they will sacrifice so much of everything else it renders them useless at anything else than just surviving. 2: These oneshot builds oneshot hybrids aswell as other damage builds. what server r u on? can u print screen the dmg? im not really clued in to the meta of all classes, what's your armor and trinkets? Do you run with food? Desolation, I closed down the game, got tired of it. I did not say bunker though, use 1 defensive trait line + gear like marauder with some def stats in + some defensive utility is a must of course. My SpB runs with Marauder + Commander kills people in few seconds if they are low on defences and I do not recall a single time being oneshot by anything. Playing zerker+marauder+assassin on revenant or sometimes zealots when we dont have FB's, and i get one shooted to awwww, from deadeyes.... and that's called bad planing to getting cought on openfield or getting myself way to noticed in a group. Its an element of the sandboxing, its kewl, except when its scourges stacking... bad players that dont know nor have skill to try anything else for the teamwork. if there was some sort of limit then it would balance out, except that will never happen cuz people will complain that their builds aren't unique anymore. That's called a gimmick build. There are lots of them and almost 100% of them rely on catching you off guard. They don't have the defenses to do anything outside of one shotting people. The Holo overheat trait is almost never taken because it means you basically can't use Photon Forge. Which means you're pretty much a core Engi with a potentially 1-shot lethal melee range burst. Have you never tasted the sweet nectar that is rifle warr? Here's something to try, son. Invite the people around you. Use the CTRL-click crosshair targeting to share your targets. One-shot those mofos back with the power of a group. "to the limit!" + F1 rifle on either core or berserker can 1 shot without having to stick to combat. Idk man been dropping plenty of thieves with Kill Shot / Gun Flame. Try switch your gear to what real warriors use - FULL ZERKERS. Buffs were made to "On My Mark!" and Might Sig actually giving might boon so it's even more amusing since literally no one expects you to pull out black betty. To be clear Hitman, your logic is that because the warrior is visible it doesn't count as a one-shot? There was some thread 'gunflame bug' or something like this . There was clip where berserker pop'd mirage for 25k with single shot ? Im too lazy to find that . All that aside, it is extremely telegraphed and the build is a gimmick. Meaning it can't do much else besides one shot cheese. So what's the point then in this theory craft build, that nobody uses, because one has to give up all defensive stances (def trait line, endure pain etc. ), lots of mobility (featherfood, swiftness etc. ), some anti condi, and some stun, as well? TO is complaining about one shots / insane damage with no or almost no counter to it. Counter to this build: dodge killshot, and one shot that "pls-kill-me-I-have-no-sustain"-Warrior. Pretty sure TO is not referring to such a build. I wasn't responding to the OP. I was trying to disprove Hitman who is saying that Warrior can't one shot. How many people in the game havent ate a gunflame at some point. dodging the oneshot is a counter that works against any oneshot. after that they might however also dodge your burst etc. till one lands his burst. but many people here think if they were able to dodge a oneshot they need to be given a freekill. if that was the case it would be stupid to attack your opponent first. Ehm, no. OP is refering to the lack of tells, esp. when burst comes from stealth. then the OP is wrong. just very few builds can oneshot and only rather glassy people without any tell. if people would look further than 300 units around their character they would see most of those 'stealth oneshotters' go into stealth and still dodge it. edit: also OP doesnt exclude oneshots with tells, he just claimes there is often no counterplay wich is wrong. and a free advice for the ones regularly dying to onehits out of nowhere: use durability runes. they removed the rng from it so you will allways have protection up for the oneshot out of nowhere. therefor you will be able to just facetank them usually. Last night I played power mirage as I usually do, a guardian was fleeing a fight and I thought "this guy doesn't deserve to live after leaving his team mates to die". So I use my auto to pop aegis and to do a bit of damage 700 with some crits. OK that's fine I now have fury I'll summon a phantasm. He dodges and starts reading a book. OK well at least I have a clone now. I'll use mirror blade. He dodges but I stow. He dodges again and is at max health because dodges heal. OK Mirror Blade and Shatter! Mirror Blade hits for about 2.5k in total with 2 crits. The Clones hopelessly chase after the guard to shatter but swiftness means he cannot be caught. He continues to spam everything from his book promptly returning to full health. This is not an isolated case and I use full berserker/assassins gear, you barely tickle guardians and they heal everything up. Meanwhile rangers can do 8-10k autos on me, holo's can pretty much hit for 5-10k on nearly all their skills in marauder gear. Perma stealth deadeye can backstab you with 0 indication they're there for 20k+. The game is a horrible mess of power creep where the 2 extremes of being ultra tanky and ultra high damage have grown further and further apart. That's sadly enough not true. In many cases you don't even see the animation and the more players are involved the more impossible it gets to dodge. WvW isn't a duel area. I don't understand why people complain about the power creep, because that's all you guys wanted six month ago. 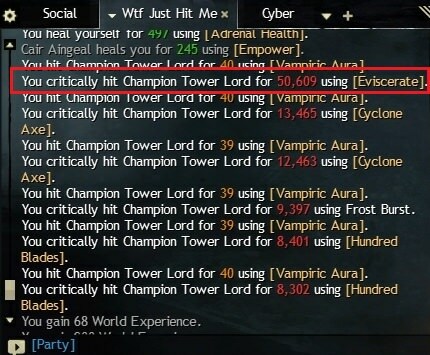 Anet heard your crying about "the condi meta". Tank builds are completely useless vs power builds. You can survive for a while, but won't kill anything. Most builds have higher boon application than they had ever before. It's not fun fighting people that can carry protection, 25 might stacks, resistance, etc and burst you for 70% of your hp with an unblockable. Most one shots aren't. It's players who don't know the other classes claiming it's a one shot, in most cases out side of DE BS etc are not really one shots and most of those require the other person to be mostly zerk. I will agree being able to spam some of these or the ones that can do these combos from stealth a bit....troll. However most are a combo of attacks done very rapidly. I have been sent mail that I was being reported for hacking because of "one shotting" on my DH. Back down on earth however it's actually 6-7 skills cast in rapid succession and one precast and timed very well. yep two shot mostly. can 1 shot with decapitate bug, have to have perfect conditions for a final thrust 1 shot, and even then it wont do more then 16k to a 2k armor foe. So the thing is the game has gone in 2 ways super bunker or super dmg. This is ok as long as in-between is viable but its not. If your not able to one shot ppl your dmg is worthless and your better off going bunker. That why you see the in-between builds more on the lines as boon strip classes or soft cc classes the "cele" scorge mostly. Sadly most gen. classes are not worth runing cele due to both not having enofe dmg and still very much being one shot able at the same time lacking an "strong" effect out side of support / dmg (lots of soft / hard cc and boon strips). It has spiked since first expansion. People complained, people then derived the bunker style thus complains faded. This expansion, damage spiked once again, no bunker style. People decided to deal with it by quitting or be the dps dude.